Zeenat was abducted en route to work on the morning of 19th of August 2015. Despite a Police investigation and a year forward, Zeenat’s disappearance and current whereabouts continue to remain unknown. 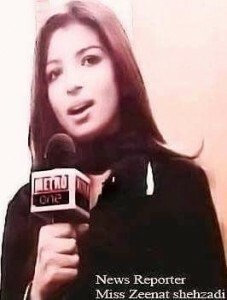 It is speculated that Zeenat was abducted as a result of her reporting the case of Indian national Hamid Nehal Ansari who was convicted of ‘espionage’ and sentenced to three half years imprisonment on the 16th of February 2016, despite the fact that prior to his conviction, Hamid had already been detained in Pakistani custody for over three and half years. Any Hope for Hamid and Zeenat? Indian national Hamid Nehal Ansari assaulted in Pakistani prison custody.